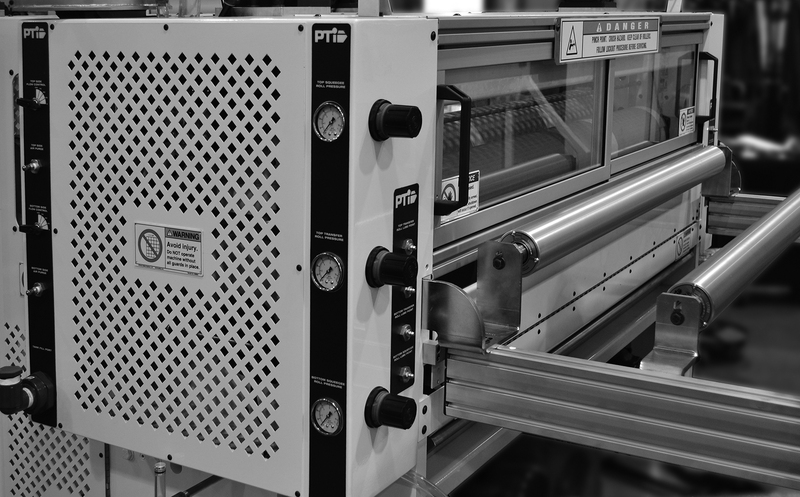 Patents and Trademarks PTi Sheet extrusion systems are always pushed to its highest innovation standard. U.S. Patent #7,165,962 Web handling roll stand. Patent granted on January 23, 2007. 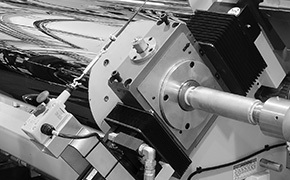 Description: A telescoping roll stand for use in an extrusion line includes a linkage connecting one or more auxiliary cooling rolls in a spatial relationship relative to each other and other auxiliary web processing components, including conveyors, load cell rolls, draw rolls, and other web handling components, when one of the auxiliary rolls is shifted in relation to a primary roll. U.S. Patent #8,021,140 Linear bearing assembly to guide movement of roll stand on apparatus for forming an extruded sheet product. Patent granted on September 20, 2011. Description: An apparatus for forming an extruded sheet product having an extruder assembly with a sheet die through which flowable material is delivered for sheet product formation and a roll stand assembly with a main frame and a roll stack sub-assembly on the main frame that cause flowable material from the sheet die to be formed into a sheet product. The apparatus further has a sub-frame assembly and a linear slide bearing assembly with at least one rail defining a travel path for the main frame and through which the main frame is guided in movement relative to the sub-frame assembly, thereby to selectively vary relative positions of the sheet die and roll stand assembly along the travel path. Patent granted on April 10, 2012. Description: A roll stand for use in the extrusion forming of a sheet product from a flowable material having a main frame supporting first and second rolls between which there is a first gap through which at least one sheet layer passes during sheet product formation. A first adjusting mechanism moves the first roll relative to the second roll so as to vary a dimension of the first gap. 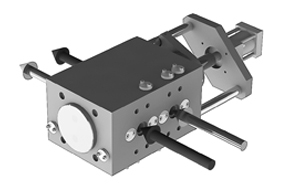 The first adjusting mechanism has a first element that is moved by a first actuator that is: a) maintained on the apparatus; b) engageable by a hand of an operator; and c) manually movable through an operator's hand to thereby cause repositioning of the first roll. U.S. Patent #8,240,180 Height positioning Mechanism for roll stand assembly. Patent granted on August 14, 2012. Description: An apparatus for continuously forming an extruded sheet product having an extruder assembly with a sheet die for delivering flowable material. A roll stand assembly has a main frame with first and second rolls. 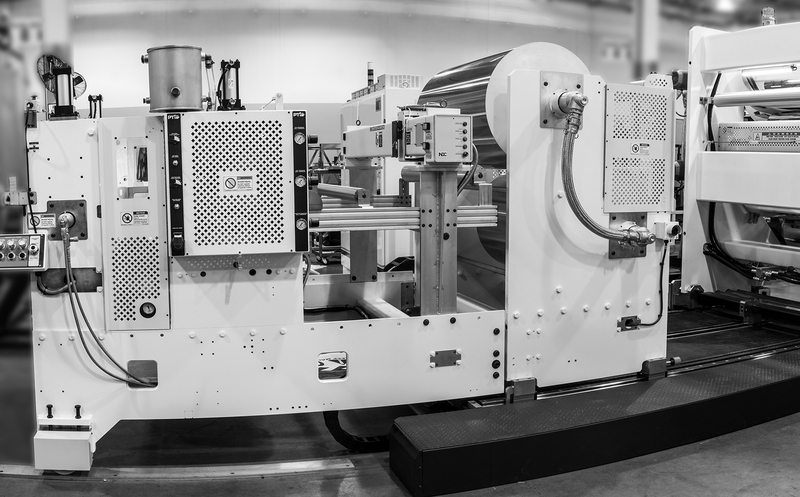 A vertical height positioning mechanism is operated to vary the relationship between the sheet die and nip location between rolls and has first and second lift components that cooperate with the main frame at first and second laterally spaced locations. 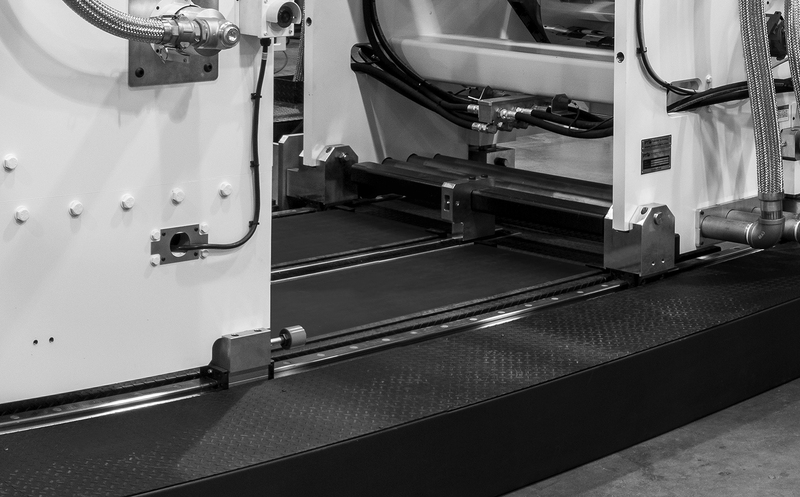 The first and second lift components are each movable in first and second opposite paths to selectively elevate and lower the nip location relative to the sheet die. 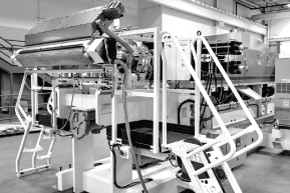 The vertical height positioning mechanism further has an actuating system to selectively and simultaneously cause the first and second lift components to move. U.S. Patent #8,342,118 Sheet coating system on an apparatus for extrusion forming a sheet product. Patent granted on January 1, 2013. Description: The anti static coater consists of a non-driven set of nip rolls through which the web passes. The nip roll arrangement contains two 8.0" diameter neoprene rolls each with its own "transfer roll." When the transfer rolls are activated, a sparger tube applies anti-static solution which is spread uniformly by the transfer roll. 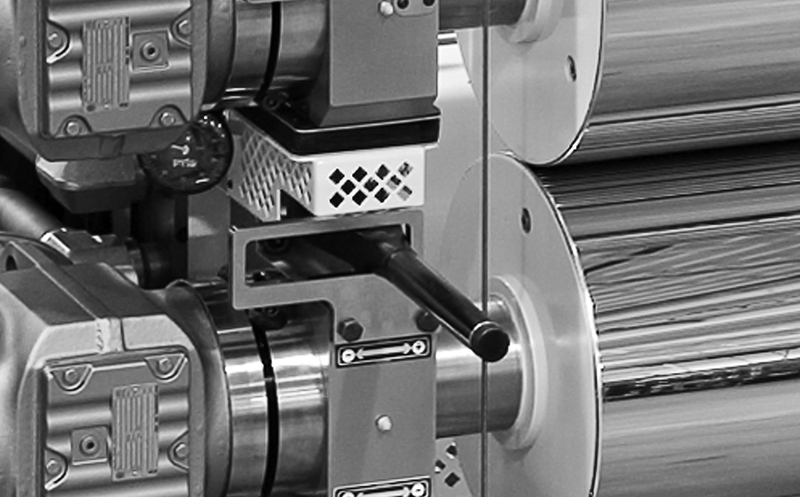 By closing one or both transfer rolls, coatings can be applied to the top, bottom or both sides of the sheet as required. U.S. Patent #8,490,643 Polymer Valve for diverting polymer during purging for color changeover. Patent granted on July 23, 2013. Description: A diverter valve controlling input of two different extruded materials has a valve body having an axially extending opening, and a valve piston axially movable in the opening between first and second positions. The body defines a first inlet for receiving a first material, and a second inlet for receiving a second material with first and second outlets opposite the inlets. 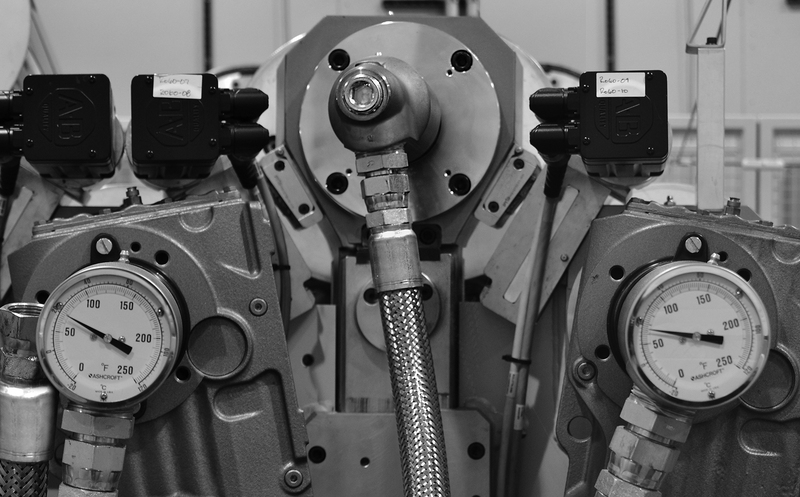 The piston has first and second through channels and first and second cross-over channels, each with inlet side and outlet side ports. A first flushing channel communicates with the first inlet and end ports, a second flushing channel communicates with the second inlet and end ports, and a third flushing channel opposite the first two communicates with the second outlet and includes a plurality of ports, with all the ports, inlets and outlets open to the axial opening. U.S. Patent #8,631,925 Adjusting mechanism for rolls on a roll stand assembly. Patent granted on January 21, 2014. Description: A roll stand assembly for processing a sheet product and having a frame and a plurality of rolls operatively position on the frame so as to define a plurality of nip locations between cooperating pairs of the rolls. The roll axes are substantially parallel with the plurality of rolls operatively positioned on the frame. Two of the rolls are relatively repositionable by guided relative movement therebetween along a first path to vary a gap between the two rolls. The two rolls are relatively repositionable by guided relative movement therebetween along a second path that is different than the first path to vary the gap between the two rolls. A control system is provided through which the two rolls are relatively repositioned by causing guided relative movement between the two rolls in the first and second paths. U.S. Patent #9,139,393 New Roll Lock-Out Safety System. Patent granted on September 22, 2015. Description: A roll stand assembly for processing a sheet product with a plurality of rolls on a frame. A first roll has a first sheet engaging surface and a first shaft assembly. A second roll has a second sheet engaging surface and a second shaft assembly. The first and second rolls are relatively movable between: a) an operating relationship; and b) an open relationship. 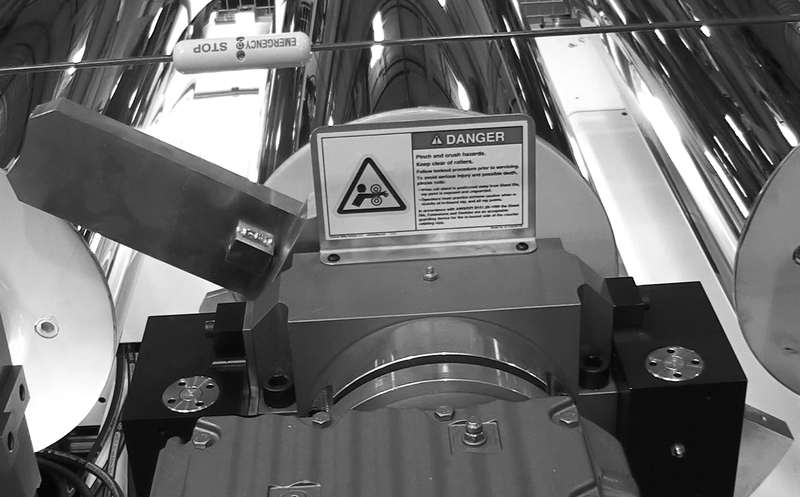 A safety assembly prevents inadvertent changing of the first and second rolls from the open relationship into the operating relationship. 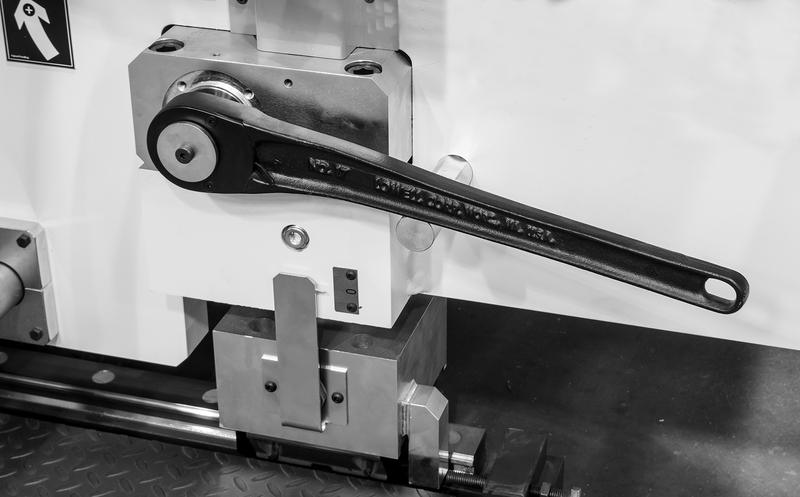 The safety assembly includes a first chuck com­ponent mounted for movement relative to the frame between: a) a running position wherein the safety assembly is in a disengaged state; and b) a lockout position. Patent granted on November 10, 2015. Description: The pressure required to produce thin PP sheet results in deflecting chrome rolls that lead to thicker gages in the center of the sheet than at the outsides. The chrome roll skew mechanism is designed to utilize this chrome roll deflection in an effort to eliminate such gage variations across the sheet. The bearing assembly mounted to the chrome roll journal is housed within and keyed to an outer housing. The machine direction position of this bearing assembly within the outer housing is controlled by a threaded push/pull device mounted on the front cap of the outer housing. Using this device to adjust one bearing assembly forward and the other backward the same amount will cause the center of the top roll to remain centered over the center of the middle roll while the deflection of the top roll will 'wrap' around the middle roll. A polymer filter assembly through which flowable material from a supply is directed for processing before passing to a die assembly through which the flowable material is deliv­ered to form a sheet layer. The polymer filter assembly has a polymer filter frame that supports processing components for the flowable material and a support assembly for the polymer filter frame. The support assembly includes com­ponents cooperating between the polymer filter frame and a base upon which the polymer filter frame is supported to allow controlled relative vertical movement between the polymer filter frame and base to thereby permit controlled alignment between the polymer filter frame and at least one of: a) an upstream component that delivers flowable material from the supply; and b) the die assembly.